Let’s see…this is one of…oh, I don’t know….about 800+ varietals found in Italy? I love Italian wine. If you would’ve asked me a year ago? I would’ve told you I had no use for Italian wine. Enter James, enter James’ girlfriend Susan, who is an importer of mostly Italian wines; enter MANY reasons! I couldn’t help but learn to love and appreciate them. Uhh…duh. I’m buying it! This is what I like to call a GVW…no, not Gross Vehicle Weight! (Hey, I used to be in the Transportation Industry…I saw this acronym on the side of Peterbilt trucks all the time! ;)) No, this would be a Great Value Wine. I couldn’t wait to try this one this evening! And you can bet I’m gonna buy MORE of this wine! The tome my husband bought me for Christmas says I can age this, although this 2008 was already drinking quite nicely at only 5 years old…. Now let me digress for a second…This book is unbelievable. Everything you’d ever want to know about every grape grown on the face of this earth, is mentioned in this book. It tells me where it’s grown, what colour it is, what it is often mistaken for, its history, origin, growth characteristics, and taste. An incredible wealth of information. 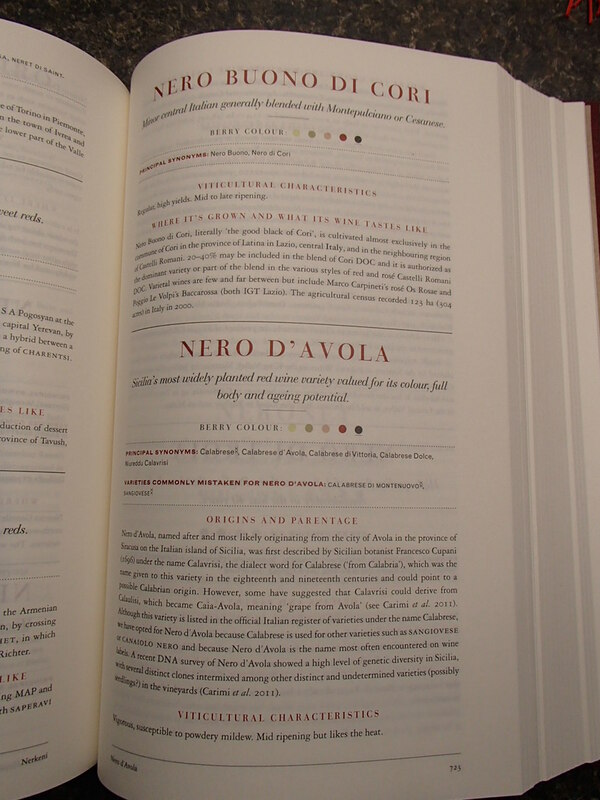 And for someone like me who is a wine geek and constantly learning…a valuable resource. This is not a book to read cover to cover, however, when needed for an immediate answer, it is THERE my friends!! Alright…so this wine….was STUNNING! From the moment I looked at its colour (which was reddish-purple with a brown tinge) to the nose that I could not stop smelling, to the palate. As I write, I am STILL enjoying this wine! 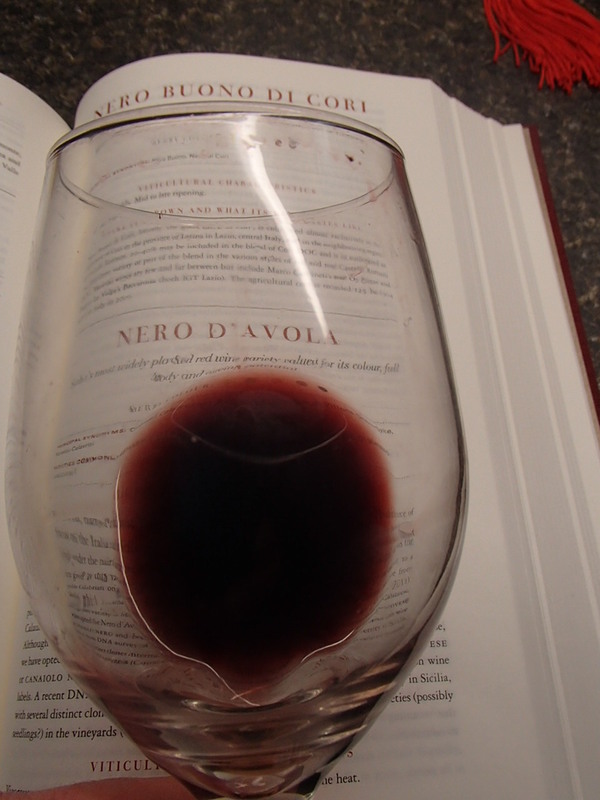 The Avulisi Nero D’Avola from the Island of Sicily had a dark black fruit, mushrooms, and just a hint of floral on the nose. Oh, and a little chocolate too! (D’arci, I thought of you just now…) It screamed of black currant on the palate with hints of anise, green cardamom and truffle oil. Balanced tannins and acid too, with a lingering finish. Mmm, mmm….delicious! And as it’s sat in my glass for the last 3 hours, it’s feeling oddly Amarone-ish to me. And I LOVE me a good glass of Amarone! If you haven’t already tried this grape varietal, then you must! I’m telling you! And this would be a good wine to apply my rule of THREE to. Don’t know what my rule of three is? Ask me! This entry was posted in wine and tagged Black currant, Italy, Mushrooms, Nero D'Avola, Sicily, truffles. Bookmark the permalink. Welcome to the club. A year ago the only wine I knew from Italy was Chianti. Sicily and Southern Italy offers some great wines, and wine values. Enjoy you adventures. Indeed! I love trying all the Italian varietals…and honestly…Chianti’s arre my LEAST favourite! I’m also loving the Primitivos out of the “heel”!